March is almost in the bag. That means a quarter of the year is done!!! It was another abnormally warm day here with record highs in the 70's . There is a fire warning out. This is only March, folks!!! We are in for storms tonight and tomorrow with much cooler temps. We need the moisture desperately. I was cancelled from work, once again. And just on call. Went in for about 30min. this morning, while a baby went for a procedure, to help cover the unit. That was after I had 2 missed phone calls and 2 missed voicemails. Not sure where they went, except I was in the car and obviously my blue tooth did not connect. Finally saw a co-worker had sent me a text. Magically, the voice mails showed up after lunch and also one from my sister from the weekend. Now, that is a reliable communication device. Soon it will be spring break for the grandkids. Nic wanted 4 nights to sleep over. I told him definitely NOT, maybe one if he is good!!! Of coarse, Harlee wants one too. Soon Cooper will be in the mix. I love them here, but it wears me out. Just putting that out there. Once little layout I finished up of the munchkins at the swimming pool last summer. Bo Bunny Jewel and Bakers Twine. Pretty quiet day at home. Still windy, but not like yesterday. We had wind gusts up to 58mph. Still delivering cookies. But I don't have too many left at home now. This little guy was just peeking at me through the deck and he let me get pretty close for some photos. Been adding a few things to my mini album for journaling our Hawaii adventure. I was having issues with the Silhouette. Oh, yes, operator errors. So much better when you actually get out a new mat for it. A couple of weeks from now we will be on the warm sandy beaches of Maui, in Hawaii. I wanted to make a mini album to journal in while we are gone. I actually had one on hand that I had made a few years back when Heidi Swapp came here for a weekend retreat. Perfect for a holiday in Hawaii. I love the colours. The travel I had cut on my Silhouette. The first page in I put a map of where we are going with a frame around it. Both are cut files from my Silhouette. I have used the map of Hawaii a few times now. Also a couple of stamps from Ali Edwards. And this is the next page. The hibiscus is a Memory box die. That page used to have a butterfly, but I thought a hibiscus was more appropriate. Will continue to work away on this and will take some stamps and die cuts with me when we go. And will use this to journal our trip. The wind has been blowing like crazy today. I had put a big rock in my bird bath and it is now blown over. Don't know if the grandkids had taken it out, maybe??? I guess semis have been blowing over on the interstate. It has been a good day to be inside creating. Also have been putting photos in my Alaska album and it is getting finished, finally. Curtis took me out for lunch. And yesterday was so beautiful. We had a high in the 70's. I got out and vacuumed my car and wiped the inside down while Curtis did his blood drive to Missoula. Kirsten had her kitchen filled with Girl Scout cookies on Thurs. evening. So, have been slowly getting those sold to people I work with. And have worked a few hours, so that means $$ for our vacation. Also heard from Canada Pension Plan and I actually qualify to get money from them since I worked in Canada for a number of years before I got married and moved to the states. Puts a smile on my face. Early Sunday evening with took a drive out to Benton Lake. It is a wildlife refuge. And usually lots of ducks and such. It is about 20mi north of town. Was on call for work this morning and unexpectedly got a call to go in so a co-worker could take her sick grandson to the Dr. Slowly and surely getting a few hours for some spending $$ for Hawaii. If girls aren't getting their hours, I am sure sneaking a few in and being available so I can work some. It sure is putting a damper on my creating time, though!!! A few water fowl on the lake. Can you see all the white dots in the middle. Those are tundra swans. They are migrating north and shortly after we arrived they took off. A duck launching to go!!! Sunset and silhouettes of birds. A pheasant in the grass. We are on the plains, but the mountains are not far away. A layout of Nic at the Christmas stroll, uptown. They say we are under a winter storm warning for today with rain/snow. So far it has been pretty nice out. Took the morning and went shopping with Kirsten and Cooper. Looking for a swim suit to put in Harlee's Easter basket. I am not a fan of too much candy and neither is their mum. Have swim suits already put away for the boys that I got on sale at the end of last summer. Picked up a couple of other goodies too, while we were out. Created a couple more cards. Another flower card for the Impression Obsession Happy Flowers challenge. The deer are in the forest with a carpet of wild flowers. And I have seen wild flowers in the mountains like this. Where all you can see is flowers on the ground. I also made another card for Darnell's NBUS challenge. I had never used the lamb stamp before, although I have used other stamps from the set. Also the Memory Box Surely stitched circle was new for my birthday earlier this month. I love the turquoise and soft yellow together. Because I was cancelled yesterday, I got to play instead. Impression Obsession has a new challenge going - Happy Flowers! So I made a card or two. A little bling and pears on the flowers. Looks like a pretty garden to me! I love these flowers. 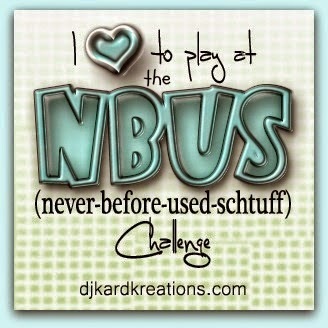 I also follow Darnell's blog and she has a NBUS (never before used schtuff) challenge . Her blog is always a fun read and very entertaining if you get a chance to go there! My never used stuff would be the Sizzix embossing folder. A bonus today, is a layout of Nic. Last weekend I was perusing my Silhouette library and came across this background and decided it would make a quick and easy layout. And it did. But talk about getting distracted easily. The yellow cloud paper is from Bella Blvd. The background was cut on the Silhouette, circles, words, hears and stars all in one piece . I added a few decorative brads. The Fancy Pants glitter words. And it was done lickity split. Once again staffing had problems this morning. I got up and called the unit. They said I needed to come in and so I did. They still had this extra person to go to peds, but that didn't work out and therefore I left. But I did renew my BLS while I was there. A good thing to get out of the way. Cloudy and overcast with rain predicted. I was cancelled from work today as less babies in the unit. I had moved off Monday to today to help even out the numbers. Then someone called to see if I would work Monday morning. I went out walking this morning. I played in my creating space. Kirsten and the crew came over to play in the back yard. We had an early supper and Curtis and I headed to Benton Lake. Those photos will come later in the week. The grass is getting green. The little violets are blooming. Leaves are coming out. So, so early for us. This usually doesn't happen until a month from now. The unusual warm temps are causing all this. It reached around sixty today. Someone lost all his curls today. And now he looks so much like his brother. He was so excited for his daad to blow bubbles. I had some papers and a photo on my desk wanting my attention. 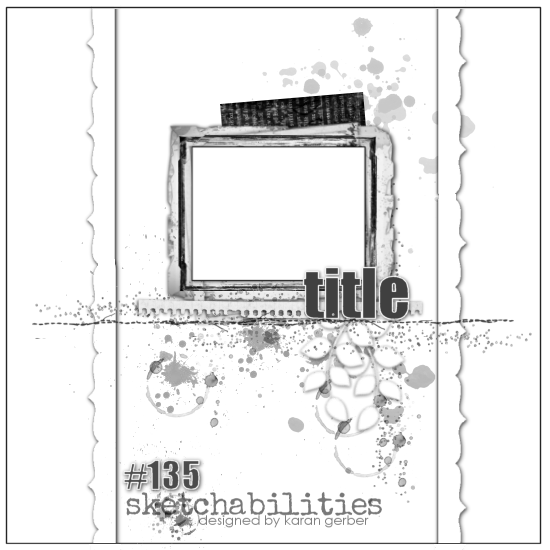 I saw the new sketch challenge come up at Sketchabilities and I decided I would just make them work. This is the photo, taken a couple of years ago, at Easter. Just a few days before Kirsten delivered Cooper. She looks wonderful for being so far along in her pregnancy. The kids were at an egg hunt where she used to work. All old Basic Grey papers that work really well with the photo. The flourish was cut on my Silhouette and then distressed and misted. And the Title was cut on my Silhouette. There is a tag with hidden journaling behind the photo. Of coarse, then I had to put together another one for Harlee's book. Still using Basic Grey papers. And made a little more girlie. I used a different edge punch along the bottom. The small bunnies are Impression Obsession die. The flourish is a Memory box die. And the arrows were from a piece of paper hanging around on my desk. Yesterday was another day of work and suppose to work again tomorrow. But they were discharging babies like crazy. So, I suppose I will just be on call tomorrow. And then another girl asked me to cover Monday morning for her. It is either feast or famine at that place. Hit the grocery store up this morning. And otherwise laying pretty low. Don't want to get run down and catch one of those nasty bugs out there right now. Today, it is Curtis' stepmum's birthday!!! She is 80, so that is a real celebration!!!!! Happy Birthday, Sarah!! Hope you have a wonderful day and are spoiled like a queen! Pictures from last summer when they took a road trip and stopped at our place for a couple of days. After not working a 12 hour shift for 52 days, I headed back yesterday. What a shock to the old system. It was busy, but I kept up and got out of the unit on time. I am tired today and hopefully will head back tomorrow. The most hours I have gotten in quite a while. Makes me happy, since it would be nice to have a little spending cash when we head to Hawaii in about 3 weeks. Not doing much today. But will get the laundry done and put away! And it looks like a beaut of a day out there. Have to post an old, old photo. 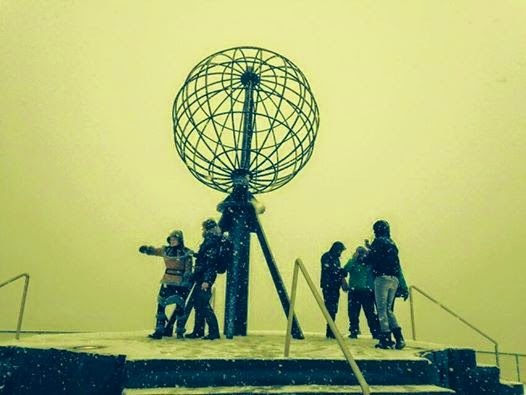 My sister is currently on a cruise of Norway. She wanted to see the Northern Lights. I told her she just should come to MT. Curtis and Kirsten went out to view them last light. This is the photos Curtis took. The photo jogged my memory and I had to get down to the basement and hunt through a photo book or two. See I was there almost 35 years ago, when I quit work and traveled through Europe for 6 months.